Your article is very helpful, I am assuming I don't have enough light. I have had these plants for 4 years, and every year I get new leaves and never flowers. From your pictures, it looks like I have new roots coming out all over, but no flower spikes. Any help would be appreciated. I live in upstate N.Y. I like your humidity trays, am going to order some this week. 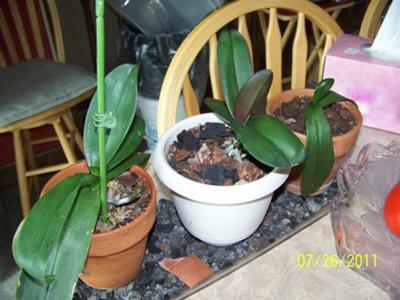 Comments for What Is Wrong With My Orchids? Your Orchids Look Pretty Good! Thank you for your question and your great pictures. I am glad my article is helpful. Your plants might really benefit (and hopefully initiate spikes) with some more light but I have seen plants that looks much much worse in terms of elongated leaves. Even some of my own plants have looked much worse. 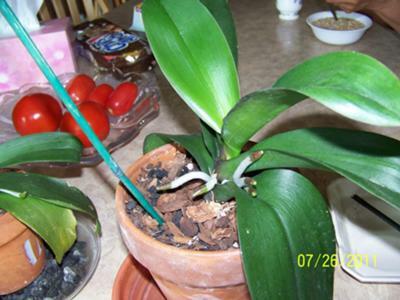 Elongated leaves are usually a great indicator that Phals. need more light. It is hard for me to tell from the pictures but you want the Phal. leaf color to be more lighter green than darker green. 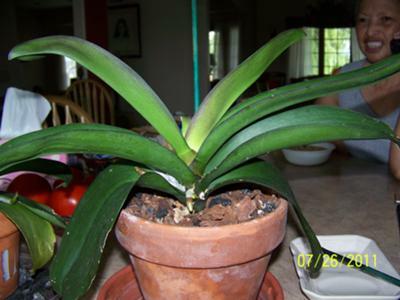 The darker the green leaf color is also an indicator that the plant wants a little more light. But really, yours look very decent. You should be proud! The fact that you are getting new leaves is great. And the roots as well. Healthy aerial roots on a Phal. are a good thing! They are growing well. I would try to find a place where they get bright, indirect light. (No direct sun!) I grow mine 3 to 6 feet off a south facing window. They like at least 1500 footcandles of light if that means anything. Give that a try if you can. Another thought is if you can get them somewhere where the nighttime temperature falls below 50 F. (but not below say 40 F.) for a couple of three weeks in the early fall it may help initiate flower spike formation. To clarify: In the early fall you would move the plants to where they would get cooler (but NEVER anywhere close to freezing) nighttime temperatures for 3 weeks and then return them to the place where they normally grow. Of course, during the day they would still not be in direct sunlight. Regarding "my" humidity trays, I like them too! I use them a lot in my house and have for years. You might just wish to check them out. 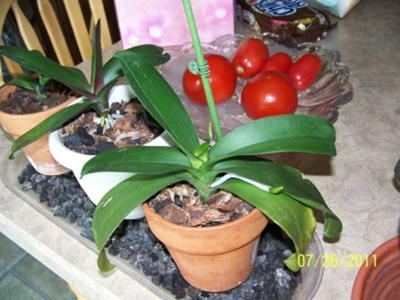 For others interested, check out my page on orchid humidity trays: http://www.orchids-plus-more.com/orchid-humidity-trays.html to see what we are talking about.